Most visitors to New Zealand are familiar with the famous snow-capped mountains of Queenstown and the impressive fiords in Fiordland National Park, however there is much more to discover in the South Island. Along the remote south coast you'll discover the beautiful waterfalls of the Catlins region, while in the west you'll see unique beaches like nowhere else in the world. If you want to discover some of the secret destinations of the South Island, here is a seven-day itinerary that takes in some of the region's most impressive sights, and some lesser-known wonders. 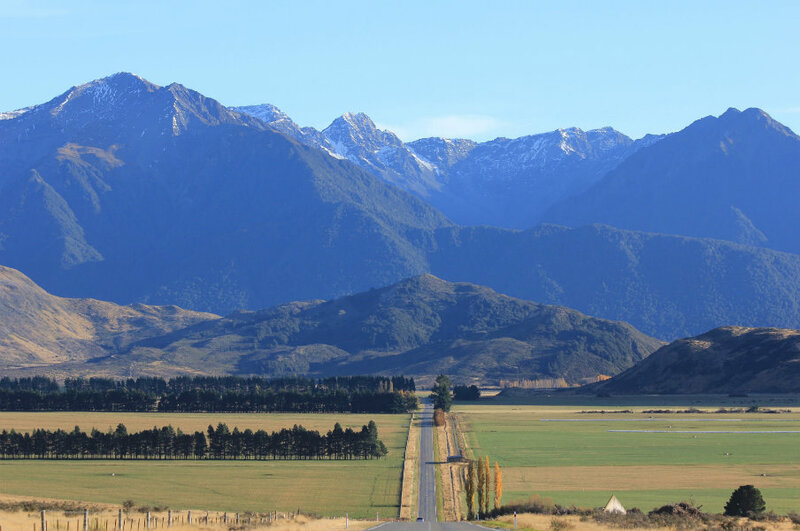 Make your way from Christchurch to the Southern Alps along one of the most scenic highways in the country. En route to Arthur's Pass you'll travel across tall viaducts, and through tunnels carved into the cliffs. You'll easily be able to rent a car from Christchurch Airport, where most major suppliers have depots on site. Leave the city on the Old West Coast Road and head for the mountains. One of the best stops along the route is Castle Hill. Located just off State Highway 73, these unusual limestone rock formations are easily spotted in the distance. The area is one of great cultural importance, and is just an easy walk from the nearby car park. 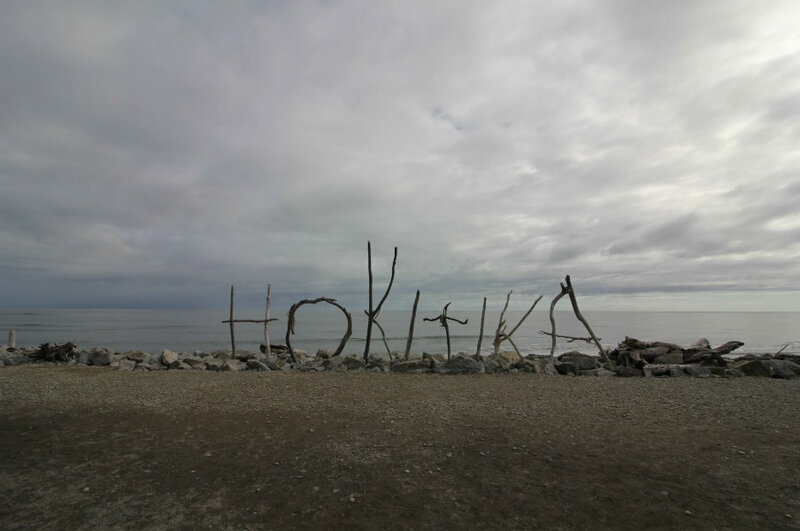 Start your second day in the small seaside town of Hokitika. There is plenty here for visitors to see, including the rocky local beach and the beautiful Hokitika Gorge. As you make your way down the West Coast, you'll see the effects of the windy weather on the landscape, with the trees bent at awkward angles, and large branches washed up on the black-sand beaches. There are plenty of stops along the road, but you'll want to dedicate a bit of time to see the two glaciers: Fox and Franz Josef. Many visitors choose to see the glaciers by helicopter, but if you would rather walk you can get fairly close to them on foot. Don't leave the area without stopping at Lake Matheson to see the impressive reflections of Mount Cook. The road into Mount Aspiring National Park is long and winding, but it will take you through some incredible scenery. One of the first stops you will come across is Roaring Billy Falls, which is a great location to get up close to the fairytale-like forest and huge mountains. The huge lakes are one of the main reasons visitors come to the region. 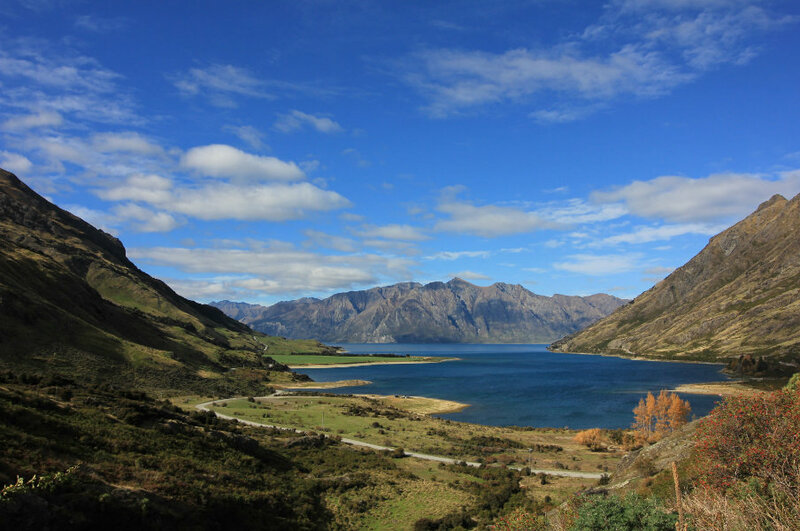 Along the route from the West Coast to Wanaka, you will pass both Lake Wanaka and Lake Hawea. From the road, you'll have plenty of impressive vantage points. End your day in Wanaka, where you can enjoy relaxing by the lake and getting a photo of the famous Lake Wanaka Tree. Highlight: If you've been impressed by the vibrant blue colour of the rivers in Mount Aspiring National Park, you'll be blown away by the Blue Pools. Just a short walk from the highway, the bright colour of the pools makes for an impressive sight. Note that there are no bathrooms on site, so you will need to drive a few kilometres to the nearest one. 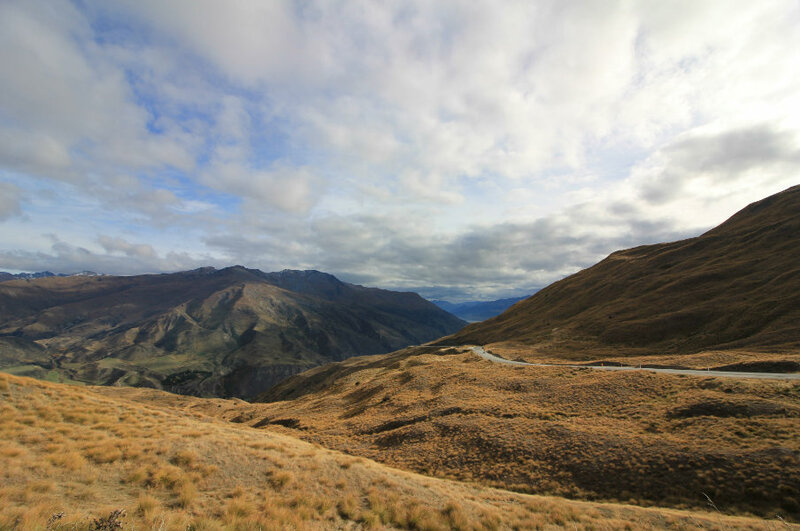 Leave Wanaka and head south over the impressive Crown Range Road. Stop by the photogenic village of Cardrona to get some great photos. The village is surrounded by some of the top-rated ski slopes in New Zealand. Bypass Queenstown and follow signs to Invercargill. The largest city on the south coast offers plenty for visitors to see and do. Once you've explored the historic town centre, head south to Bluff to get one of the best views of the coastline. 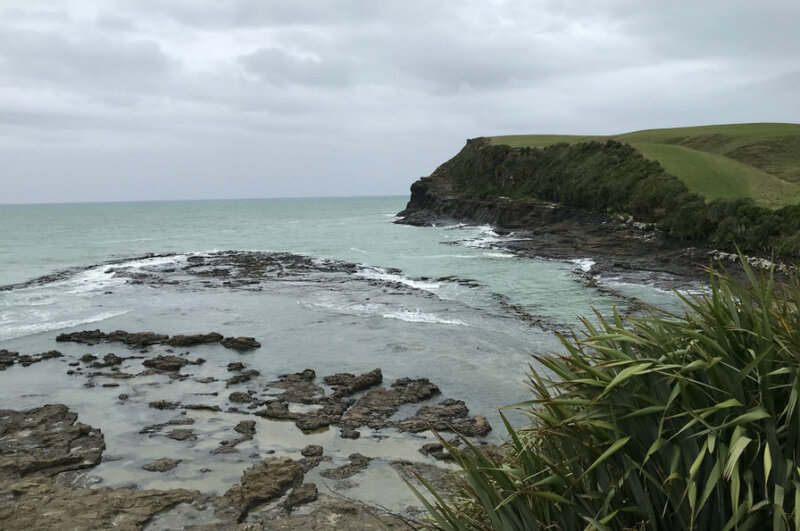 You'll easily escape the crowds in the Catlins, but the scenery will have you questioning why the area is not bustling with visitors. A region filled with waterfalls, forests and remote coastline, there is a lot to explore. Stop in for refreshments at Fortrose before continuing along to Curio Bay. Here you can see penguins and the famous Petrified Forest. One of the most impressive sights in the Catlins is Nugget Point. A winding, narrow road will take you up to the start of the walkway. No doubt you'll be battling the elements as you make your way out to the lighthouse, but you'll get a great view of the rocky coastline. Important: It is important to note that many roads in the Catlins are not sealed, so you will have to stick to the main highways. Follow the Niagara-Tokanui Highway instead of taking the unsealed Fortrose-Otara Road if you want to visit Curio Bay. You could easily spend days exploring the southern city of Dunedin. The Scottish influence is evident here, as its artistic leanings. Follow the Street Art Trail to see some of the historic buildings of the city, and see unique artworks. From the city's central Octagon, you will be able to walk down to the iconic train station. The station has an impressive facade that has earned it worldwide recognition. With your rental car, you'll also be able to visit other city sights like Tunnel Beach and the world's steepest street. The trip from Dunedin to Christchurch will take you through some historic towns and provide some great wildlife-spotting opportunities. 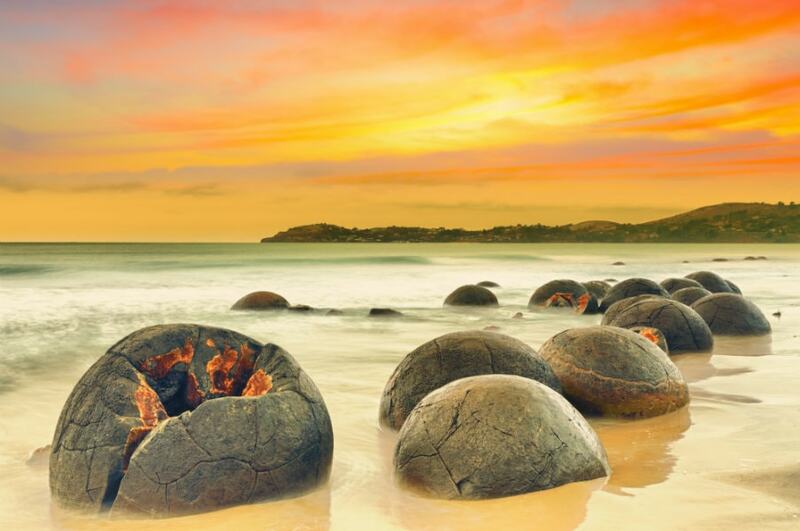 Outside of Dunedin, your first stop should be the Moeraki Boulders. From the Moeraki Boulders Cafe, it is just a short walk along the beach to the boulders. 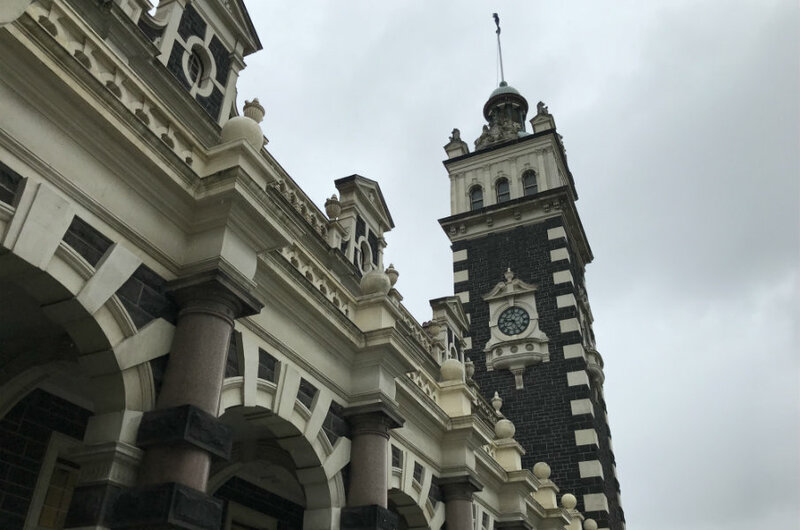 The town of Oamaru is also worth visiting. Explore the heritage buildings along the waterfront, and shop in some of the unique shops that line Harbour-Tyne Street. In both Oamaru and neighbouring Timaru, you'll be able to see penguins at certain times of the day along the beaches. Read about other popular road trip routes in New Zealand.